Since its first publication in English in 1954, The Gift, Marcel Mauss's groundbreaking study of the relation between forms of exchange and social structure, has been acclaimed as a classic among anthropology texts. A brilliant example of the comparative method, ?The Gift? presents the first systematic study of the custom—widespread in primitive societies from ancient Rome to present-day Melanesia—of exchanging gifts. The gift is a perfect example of what Mauss calls a total social phenomenon, since it involves legal, economic, moral, religious, aesthetic, and other dimensions. He sees the gift exchange as related to individuals and groups as much as to the objects themselves, and his analysis calls into question the social conventions and economic systems that had been taken for granted for so many years. 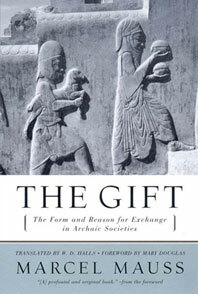 In a modern translation, introduced by distinguished anthropologist Mary Douglas, ?The Gift ?is essential reading for students of social anthropology and sociology.